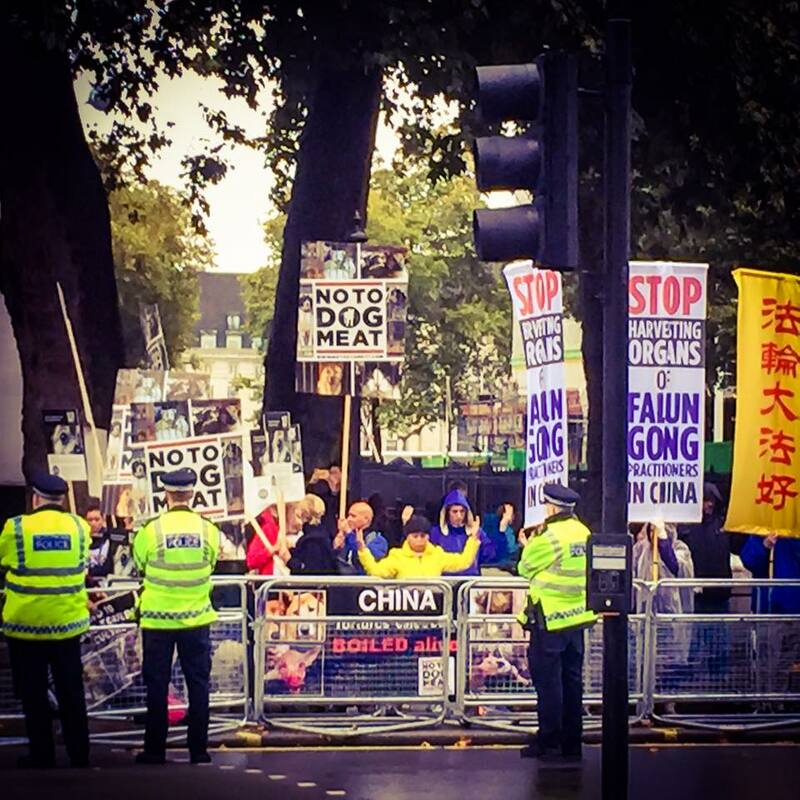 On Wednesday (21st Oct 2015) No To Dog Meat met in London to protest against the cruel and horrific animal abuse and animal rights violations of the dog meat trade during the stay of President Xi of China. As often is the case during our winter (and summer!) protests it was raining as we met at the Chinese Embassy as planned. However once we realised that Chinese President Xi was in a meeting with David Cameron we traveled to stand at Downing Street alongside those protesting against the Chinese state persecution and human rights violations of the Falun Gong people. Although President Xi was eventually spirited away from the scene via a rear exit to Downing Street (no doubt in order to prevent him from seeing the protests) we were glad and proud to have been able to make our statement and take a stand for the dogs and cats of China in front of the gathered crowds and passing traffic. Although we may agonise as we watch the West’s seemingly silent complicity with Chinese state abuses, the growing trade between nations is only one feature of a world which is rapidly opening up and changing. It is hard to imagine the Chinese people will not increasingly demand their right to a system which is fairer and more compassionate for humans and hopefully all animals, as people are now beginning to push for all over the world. This is the hope and goal all animal activists must fix their eyes on.